Pilgrim Experience: Aussie pilgrims at World Youth Day in Poland. WHILE some of us are reminiscing on the recent Splendour in the Grass festival last weekend, Brisbane Catholics are revving up for the biggest Catholic youth festival in the world, World Youth Day Panama. This year marks 10 years since Aussies welcomed Pope Benedict XVI on our shores for World Youth Day in Sydney. Like the experience of young people a decade ago, deciding which youth festival to go to can be based on a process of elimination which takes into account factors such as genre, reviews and recommendations from friends and family, cost, location and time. Two young people share with us how these factors and curiosity came into play when they said “yes” to travel to one of the biggest Catholic gatherings of young people at World Youth Day 2016 in Poland. 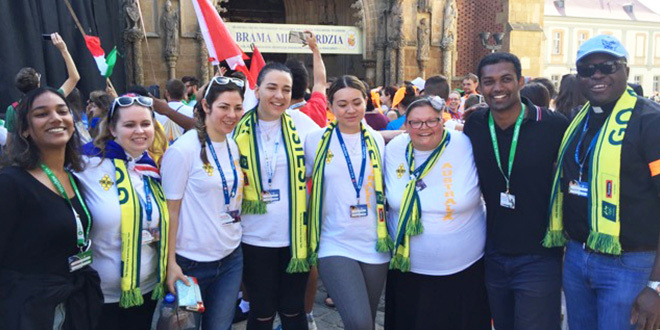 “World Youth Day sets your heart on fire for God and His Church,” April Coogan, who travelled with five young adults from the Ipswich Catholic Community with Father Chukwudi Chinaka to the ‘City of Mercy’, Krakow, Poland in 2016, said. Miss Coogan says that God was present in every moment and experience of World Youth Day. Among the 2.5 million youth Catholics, she witnessed young people lining up to receive the sacrament of reconciliation. “Young people thirst for someone to care for them, we thirst for the truth and the Sacraments allow us to embrace Jesus fully with our whole heart,” she said. “You don’t realise the change God has worked in you until you come home and start to see Jesus in every person you encounter. Miss Coogan’s travelling companion, Felicity Jones echoed her experience of World Youth Day in Krakow. “I almost didn’t go to Poland, yet something within me was feeling called to World Youth Day. So I said what I think was my very first ‘yes’ to God,” Ms Jones said. “What I encountered went beyond anything I was prepared for. In journeying with her group she said that the opportunity to reflect each day was important. “Listening to everyone’s reflections taught me to look for God in the smallest of things, and in the most unexpected people. Today, I can see God working all around me and within everyone I meet,” she said. “I know He cares about me and I know He loves me. World Youth Day gave me new eyes, and for that I am forever grateful. Miss Jones and Miss Coogan are a part of the leadership team for The Hive Youth and Young Adult Ministry at the Ipswich Catholic Community. The Brisbane Pilgrimage group to World Youth Day Panama is currently accepting registrations. If you, or if you know someone who would benefit from this experience, please register on the website: www.wydbrisbane.org.au.